Tamil star Dhanush, whose latest film Maari has opened to decent reports, is gearing up greet his Telugu fans yet again. 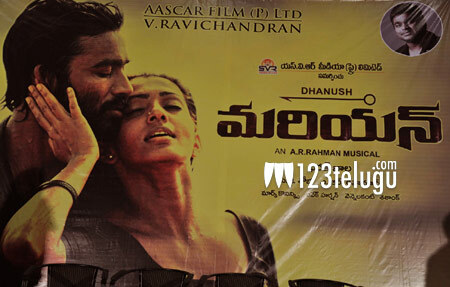 The National Award winning actor’s 2013 Tamil film, Maryan, has been dubbed into Telugu as Mariyan, and the film will hit the screens on the 31st July. The film is being released in the Telugu states by SVR Media Pvt Ltd. and it has music composed by AR Rahman. Mariyan is directed by Bharat Bala, a popular ad filmmaker who is known for his chart busting music video Vandemataram with AR Rahman. Mariyan is a cross-border emotional tale of love which is set in a southern coastal village and in the African country of Sudan. Dhanush plays Mariyan, a contract labourer who is captured by the Sudanese militants for ransom. The film also features Parvathi Menon playing Dhanush’s love interest. Maryan was a critical success in Tamil and Dhanush is bound to impress his fans and critics yet again this month end.